I know that everyone is talking about this book and it is generally regarded as the cat's pajamas. Having heard such great things about it, I dove in, despite my misgivings about the gloom-and-doom summary and the hefty size---769 single -spaced pages, to be exact. I'm sorry to report that I gave up 72 pages in. I could tell that this book was going to make me sad, and there is enough sadness in the world without me reading something that adds to it. That's why this blog is called "I'd So Rather Be Reading!" I read to be uplifted and entertained, and if that makes me a mindless sap, well, I'm a mindless sap. 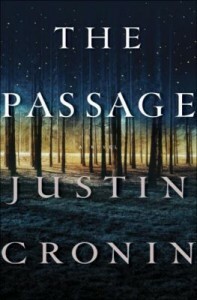 I'm sure that The Passage is thrilling, gripping, and satisfying, but it reminded me too much of Cormac McCarthy's The Road (a book which catapults me into a melancholy state every time I think about it almost a year after reading it) and I decided it wasn't for me. Want to be really depressed? Watch The Book of Eli, the movie version of The Road and listen to the audiobook of The Passage all in the same week! LOL Talk about wondering what is that point of living at all? ?